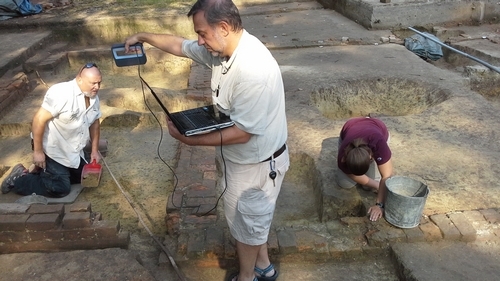 On July 30, 2014, I visited the excavations of an 18th-century structure on the campus of the College of William and Mary, adjacent to the Wren Building. The excavations, conducted under the auspices of the Colonial Williamsburg Foundation CWF), have uncovered the remains of what appear to the the foundations of a brewery. The scan made using the Sense 3D scanner focuses on a part of the structure showing where an addition had been made, cut by a modern utility line. 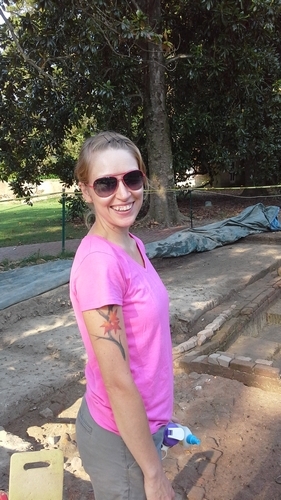 CWF archaeologist (and former intern in the VCL) Crystal Castleberry provided me with a tour of the excavations. Scanning the foundations. Photograph by Crystal Castleberry. Today’s animations are two different views of a Colonial-era cellar that may be attributed to George Washington and his family in the home where he grew up as a boy from the age of 6 until his early 20s. 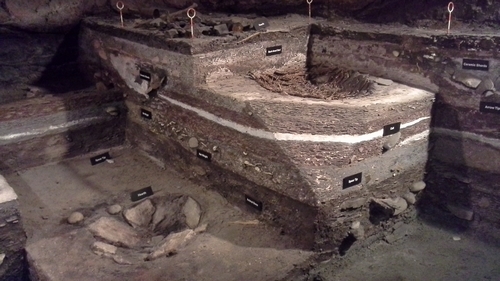 One quarter of the cellar was excavated in early July of 2014 at George Washington’s Ferry Farm and animations of the feature are present here. A second quarter of the cellar is currently being excavates and was scanned by Allen Huber using the Sense 3D scanner on July 29, 2014. Using editing software, I “opened” up one side of the cellar to make it easier for researchers to view. Today’s animation is a forensic reconstruction of a woman recovered from the Schuyler Flatts Burial Ground, an 18th century African American cemetery near Albany, New York. More details on this cemetery can be found here. 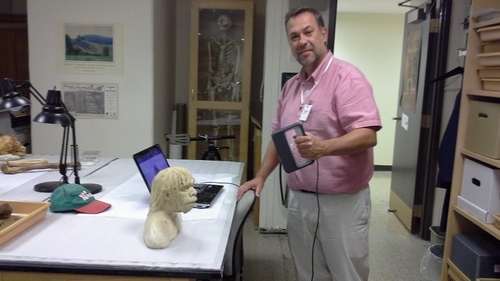 This reconstruction of the individual from Burial 9 was scanned at the New York State Museum (NYSM) by NYSM bioarchaeology technician Julie Weatherwax using the Virtual Curation Laboratory’s Sense 3D scanner. The artist who sculpted this face is Gay Malin, a former NYSM exhibit specialist. Today’s animation is from a plaster reconstruction of a Neanderthal man that was in the bioarchaeology laboratory of the New York State Museum (NYSM). 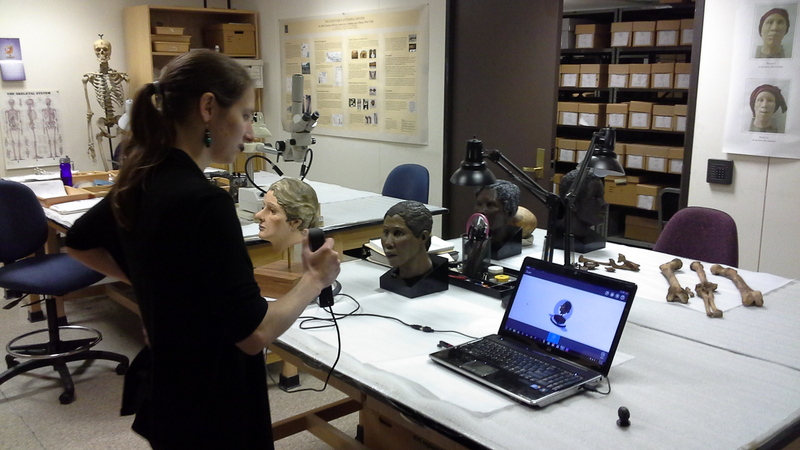 I scanned this bust using the Virtual Curation Laboratory’s Sense 3D scanner. Today’s animation is a forensic reconstruction of a woman recovered from the Schuyler Flatts Burial Ground, an 18th century African American cemetery near Albany, New York. More details on this cemetery can be found here. This reconstruction of the individual from Burial 3 was scanned at the New York State Museum (NYSM) by NYSM bioarchaeology technician Julie Weatherwax using the Virtual Curation Laboratory’s Sense 3D scanner. The artist who sculpted this face is Gay Malin, a former NYSM exhibit specialist. Our animation for today is a large mammal bone scanned from the faunal type collection at the Virginia Museum of Natural History (VMNH). Normally, we use the NextEngine Desktop 3D scanner for bone, but I wanted to see whether the Sense 3D scanner could work with a large bone. While the Sense 3D scanner works reasonably well for features and people, the quality of the scan for even a large bone is not sufficient for analytical needs. 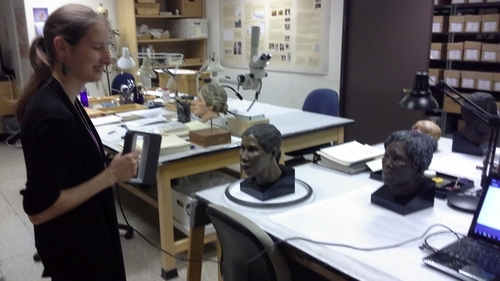 VMNH intern Jessica Clark assisted with this scanning effort on July 18, 2014. 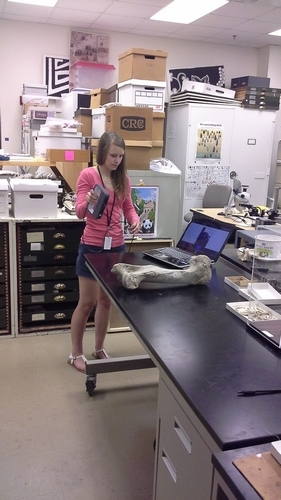 Jessica Clark scanning the large mammal bone.